When it comes to fast food in the animal world, it can't come much quicker and easier than it did for this smug alligator. While it was certainly fortunate timing for crafty predator, it was the last, and most unlucky, moment for the Florida gar fish who unwittingly jumped straight into the alligator's jaws. 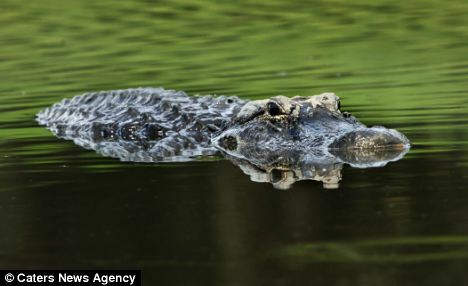 The incredible moment was snapped by wildlife photographer Marina Scarr in Florida, America, during a summer heatwave. 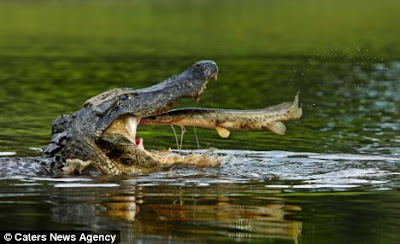 The great pictures show the needle fish jumping out of the Myakka River and into the alligator's open mouth who, after flipping it over, swallows it whole. The fish stood little chance against the more than 70 alligators who had descended on the river when the water levels dropped during the drought in July last year. Ms Scarr said: 'I photograph there a lot. A friend told me the river was extremely low and there were lots of alligators present and he said it would be a good time to take photographs. 'I went down right to the river edge waiting for the action. I was there for three days, spending eight hours a day waiting for something to happen. 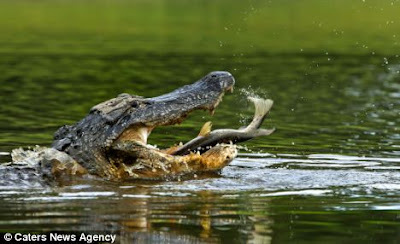 'When the alligator got the fish he kept flipping and flipping it over until he got it in the right position to swallow it. 'That day we counted around 76 alligators in this particular spot. It was an area where the river had got really shallow because of the drought and the fish couldn't move. 'It was unbelievable. I've never photographed anything like it before. The power of the gator was really something special. I felt lucky to capture the moment. It was spectacular. 'You have to keep cool when taking the photographs because you are so close. 'I wasn't worried I would get eaten but another time I had to jump up and run away. 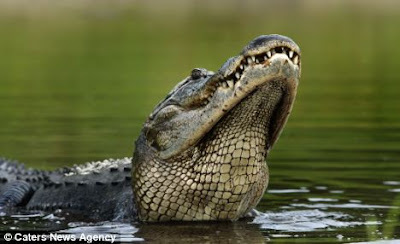 Female alligators rarely exceed 9 feet in length, but males can grow much larger. 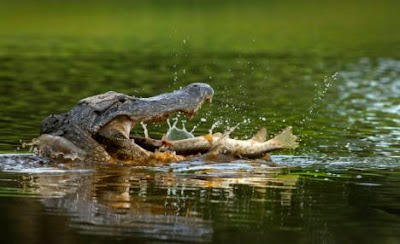 The Florida state record for length is a 14 foot male and the record for weight is a 1,043 pound alligator, while Florida gar fish can reach over three feet long.